The Hub Karen invests at least sh1 Billion in an environmental conservation program. Solid waste generated from shopping malls and related commercial facilities has been cited as a major contributor to the urban waste disposal challenge locally and abroad. To handle the challenge, The Hub Karen Lifestyle complex developers, have confirmed plans to strengthen the facilities solid waste management systems; to enhance environmental conservation efforts. 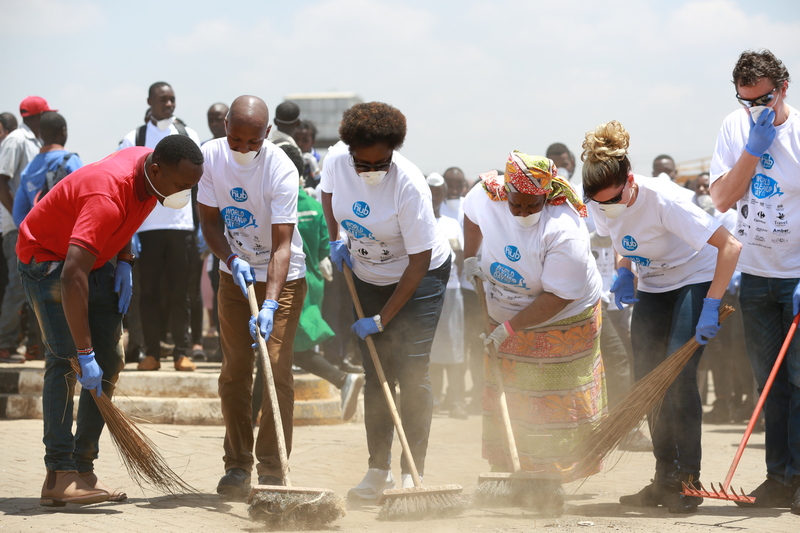 Speaking at Ngong Town, during an event to mark the World Clean Up Day sponsored by Azalea Holdings, the developers of The Hub Karen, the firm’s Group Managing Director Margaret Mbaka said the firm, has invested more than Kshs 1billion in the facilities environment management systems. The firm, she added, has as part of the investment, adopted advanced waste minimisation and management systems for the mall. Alongside the facility waste minimization systems with a capacity to handle more than 10,000Kgs of solid waste weekly, The Hub Karen is also playing a key role in public education and awareness programmes to facilitate behavioural change and sustainable environmental conservation. At The Hub Karen, the firm, Mbaka said has integrated an-on location sewerage treatment plant and solid waste transfer facility. The sewerage plant, featuring an advanced grease trap system, allows the firm to discharge treated water to the Nairobi Sewerage system and sorted garbage for delivery to the Dandora Waste site. Clean recycled water from The Hub Karen is also used to run a car wash facility further reducing the overall strain on scarce water resources. Available global reports from Singapore, indicate that rubbish from large shopping malls made up 7 per cent of the total waste discarded in the country last year. The Singapore National Environment Agency (NEA) Singapore National Environment Agency (NEA) recently indicated that, last year, 225,000 tonnes of waste was disposed of by 172 shopping centres. This was out of a total of 245,000 tonnes of waste generated overall at these malls, meaning most of the waste was not recycled. The Hub Karen lifestyle destination mall, spanning over 376’000 sqft (35’000sqm) features more than 1,300 eatery seats and 85 shopping stores hosting local and international retailers. Some of the brands in the mall include French retail giant Carrefour, Furniture Palace, Funscapes, LC Waikiki, Woolworth, F&F Fashion, Miniso, Bossini, Adidas, Reebok, Burger King, Dominos, KFC, Artcaffe, Spurs, Ocean Basket, Zucchini and Decathlon (opening in Q4 2018). The Lifestyle destination mall, is part of the Janus Continental Group, an international conglomerate, comprising of market-leading companies in the Energy, Hospitality and Real Estate sectors.